In the Desert, Tablet Review, Tablets, APP's, Accessories, More info. These are the choices we made at In the Desert and you may decide on other options, but at least you'll know what to expect with these. Also be aware that it won't matter if you go with a Google tablet, Samsung Galaxy tablet, or an Apple ipod smart phone, very little difference, except the price and size of the screen. We chose a 7 inch tablet. Plenty of screen real estate and yet small enough to not take away from you view of the trail or scenery around you. If you look at the enlarged view above you'll notice that the track ( in RED ) is larger and that the position ( red arrow ) is larger on the tablet. You can adjust them to whatever size or color you'd like to see on the tablet. You can import or export .gpx files. This makes it convenient to put the files on your computer, in Drop Box or elsewhere to share. You can import tracks to the tablet to view them or view someone else's tracks. If you do a lot of hiking or bicycle off road then you'll no doubt want a hand held GPS unit, in that case, Buy a Garmin. If you off road in a 4x4 then we'd highly recommend you try a tablet, Samsung is probably the best at the time of this publication. In your vehicle, which GPS would you rather look at? 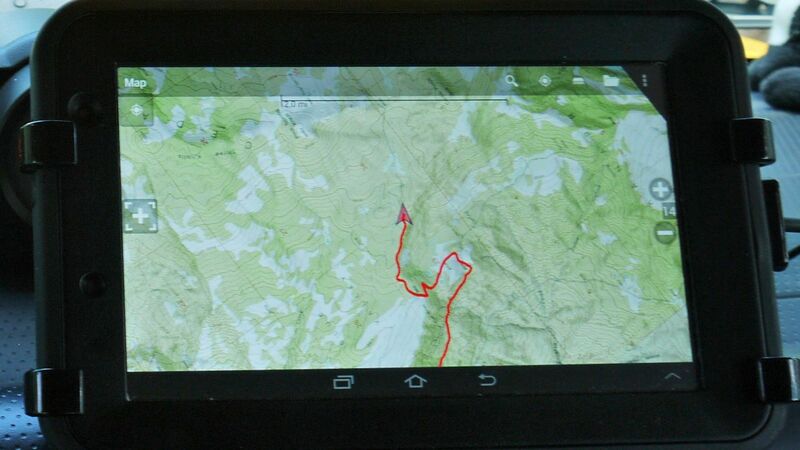 Also not listed above is the Critter Map- BackCountry Navigator GPS ( BCN ) application. Both are linked below. BCN is one of a few we looked into and it is by far the most user friendly with a lot of map and aerial map options. Really nice software. And you may also want to invest in a case for the tablet. The Samsung tablet is the only one we have experience with and it has worked fine for quite a few years now. Also there is another mapping program (look on Google Play) called Gaia mapping that a lot of people say works great also. We haven't had any experience with this APP though. Garmin makes what we consider the best GPS units and we've used quite a few of theirs and have even had experience with other brands. The Garmin Units are the best and are easy to work with. We chose a tablet because of the screen size, which makes it easier to see the surrounding areas when traveling off road. Plugging your tablet into this in your 4x4 will save the tablet's battery, and keep it charged. Find a mount that works with your vehicle. For keeping your tablet running in your vehicle without using the tablet's battery.